I'll admit...I can't tell you much about the scientific structure of amino acids, but I can tell you how they can benefit your health. Let's keep it simple! 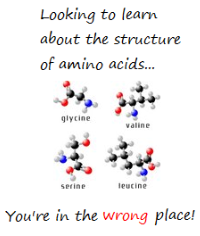 Amino acids are the "building blocks" of protein and proteins are the building blocks of muscle and other tissue. Your body breaks down protein by releasing stomach acid and other enzymes to aid in digestion. Foods high in protein tend to take more energy to digest because they are denser than most other foods. Your digestive system needs to be in good working order to make the best use of the amino acids the foods provide. After the proteins are broken down, your body absorbs and stores or absorbs and uses the amino acids. Amino acids are stored in the liver, there they help make proteins to maintain and repair your muscles and tissues. Your nervous system also depends on amino acids function properly. Amino acids enable our bodies to make neurotransmitters, the signals that travel from nerve to nerve. Lack of amino acids can result in lowered levels serotonin, which promotes feeling of well-being and happiness. A reduced level of serotonin in the brain is linked to mood disorders and food cravings. Essential amino acids are those amino acids that must come from foods because the body can not create them from other sources. They must be consumed through diet nearly everyday.